In the last week I have had 14 missed calls from mobile number 07520905031. I have rejected them all because my Truecaller app identified them as coming from an ‘Accident Claims Manager’. This morning I decided to take the 15th call. The caller asked me how I was today. I asked why they kept pestering me. He immediately hung up. Sadly, there was no mention of the specific sums that were waiting to go into my bank. I have had occasional calls and texts over the years but 15 calls and 2 texts in one month smacks a bit of desperation. Just for the record I haven’t been in an accident since I fell off my bike in 1982. I have now registered my home and mobile numbers with - www.tpsonline.org.uk/, which I should have done a long time ago. This kind of behaviour puts all genuine victims at risk. 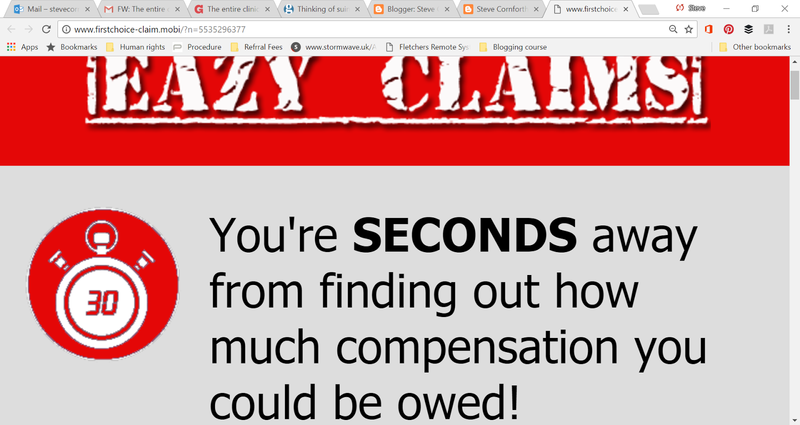 Ordinary people are being pushed to pursue claims – even they are for fictitious sums of money following fictitious accidents. 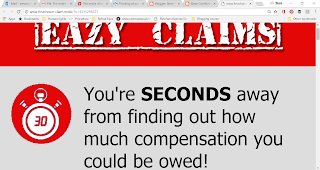 I have written many times that the so called compensation culture is a myth. Claimants, Insurers and the government should be doing all they can to stop those who are trying to create one. I was reminded last week about a case in which I was involved back in the 1980s – when the world of legal practice was very different. And I was younger and fitter. Towards the end of 1986 there had been a growing dispute between Liverpool City Council and local residents in Everton. This focussed on council plans to build what is now known as Everton Park. And a very nice park it is. This was part of the regeneration of what had become a very deprived area of the city. The problem was that the plans included the demolition of some good quality four bed roomed houses. Residents, including local church leaders formed the Langrove Street Action Group. Activists began to squat in empty houses to delay demolition. They were supported by a barrister, Mark Hedley who lived in the community – he later became Mr Justice Hedley. I was advising the group who were also supported by the housing charity Shelter. In February 1987 I received a telephone call from Mark to advise me that demolition workers were due on site the next day. It was likely that so much damage would be done, that further opposition would be pointless. The next morning I was in Liverpool County Court on another matter when I was paged on the tannoy system to ring the office. I had a message to ring Mr Hedley (no mobile phones back then). He advised me that work had started. He said that there were grounds for an injunction based on a failure to consult residents. He had handwritten the papers. I ran to my car, drove at great speed to his house and then to my office where I had every available secretary typing up the application. I then ran back to the car (running features a lot in this story), drove to Langrove Street to collect the two residents who were to be the Plaintiffs, drove them to a local solicitors office to swear their affidavits and then to county court office where Mark was waiting for us. These were days when you could turn up at the court office and have real people to help. I explained the urgency and told them that slates were being pulled off rooves as we spoke. Their support was remarkable. They issued the application and then went to find a judge. Within half an hour we were before Judge Bernstein who granted the order. Court staff again worked at staggering speed and within an hour of arriving at court I had the piece of paper in my hand. I left the others and ran (more running) back to the car and drove to Langrove Street. I ran across the estate waving the injunction. It was only at this point that I realised that the demolition team were big, strong and not too happy! One of them towered over me like Giant Haystacks (remember him?) and aggressively asked if I was ordering him to stop work. My knees and hands were shaking as I muttered something like – 'It’s not me it’s the judge’. Thankfully he backed off just as the TV cameras arrived. The work stopped. The damage was contained. The dispute was finally resolved outside the courts. A change in the make up of the council meant that the decision to demolish was reversed. The court action had bought the residents essential time. The estate was eventually renovated and I was there when Glenda Jackson officially opened the new project in 1990. This was one of those days when you remember why you became a lawyer in the first place. It was remarkable example of teamwork between local activists, lawyers and the courts. The court in particular acted swiftly and efficiently. The law can be used effectively to secure justice for ordinary people. It just seems so much more of a challenge these days.